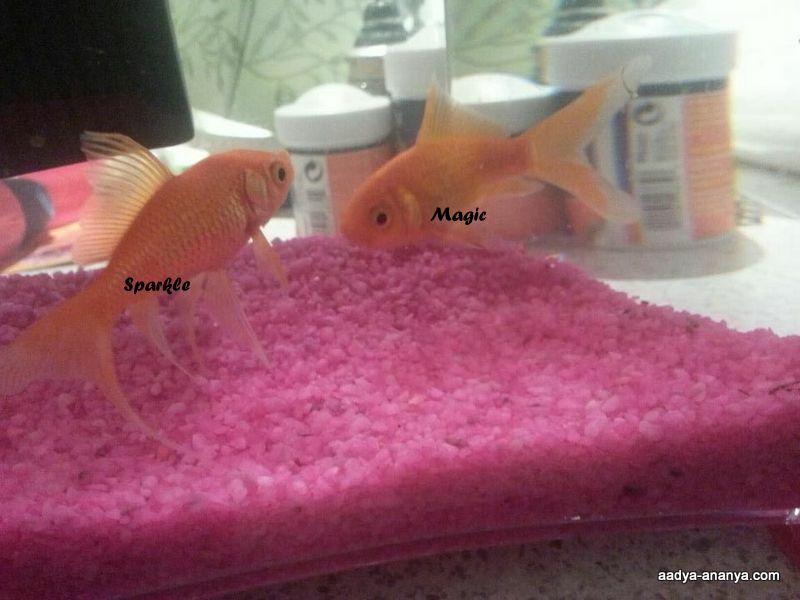 Introducing the newest members of our family-Magic and Sparkle! The girls are over the moon..Aadi keeps on trying to kiss them,from the outside. Nanhi has been trying to scare them.She stands right under the kitchen counter and raises her hands like claws and tries to roar! !LOL!It is so cute!! But you know who is the most smitten?Its SD! He checked on them before going out for his cricket practice and the first thing he said when he came back was-Hello fishies!!LOL! not even hello girls! Thats’s been the highlight of our day here..in other news,I have a bad case of hay fever and spent most of the day in bed,nursing a headache!Hope you all had a good day! Welcome home 🙂 nice name u both got 🙂 happy first birthday! Cute fish! love the names 🙂 hope you are feeling better.